Dr. Rebecca Salter knows how important individualized instruction is, which is why she prepares for hour-long, one-on-one applied voice sessions for her students. Crafting each voice lesson to fit each student keeps her on her toes and, she reports, “requires intense focus from both the student and teacher.” A key component of that individualized attention is building relationships with students, knowing their strengths and weaknesses, and building on their talents. Salter, an associate professor of voice and voice area coordinator at Reinhardt, learned firsthand how important building lasting relationships is in her studies. Salter stays in touch with her mentors, as well. She describes Larry Keller of Oklahoma City University as having raised her, “musically speaking.” She still takes the occasional voice lesson with of Salvatore Champagne, her former professor at University of Oklahoma, who is now at Oberlin Conservatory of Music. “Watching [my former students’] lives and careers unfold, whether they end up on Broadway or in front of a classroom of middle school choristers, is the ultimate reward,” she said. In addition to teaching, Salter serves as vice president of the Georgia Chapter of the National Association of Teachers of Singing, and as a member of Pi Kappa Lambda. 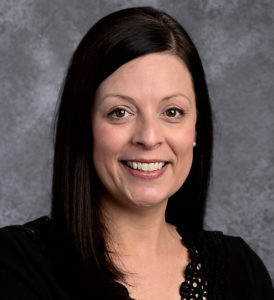 During her time outside the classroom, Salter enjoys taking long walks with her husband, Joseph, reading and spending time with friends and family. Thank you, Dr. Salter, for the great time and energy you invest daily in your students.